Rollover tooltips and quick properties both give you quick information of your object. Rollover tooltips will appear when you hover your mouse above an object. Quick properties is a palette that will open when you click an object. Or you can set it to open automatically when you select object. Let’s say you are a surveyor. You would like to get information of an object quickly, like what is the object, its length and its area. You can just hover your mouse above it, and don’t have to inquiry its length and area! Isn’t that cool? If you want to have this on your tooltip, open CUI dialog. You can work with your own customization file or just use default CUI. You will see a list of objects at the right pane. If you use your own CUI, this list is still empty. Click edit object type list to add objects to this list. You will see a complete list of AutoCAD objects. Select all objects which you want to modify the tooltip appearance. Let’s say I want to customize polyline tooltip. I click it and click OK. Now polyline is on the list. But it has an exclamation mark. It means we haven’t defined any properties yet. So click all properties you want to show on tooltip for this object. 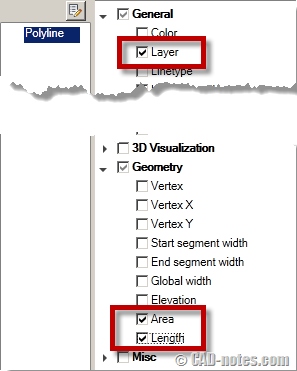 I select layer, area and length here. Click OK to accept your changes and close CUI. Now test it. Create a rectangle or polyline and hover your mouse above it. Pretty cool right? What about quick properties? You can do it the exact same way. But remember, you may want to select properties you change regularly. AutoCAD users probably use command alias as shortcut more than keyboard shortcut. And many probably don’t even realize this kind of shortcut exist. 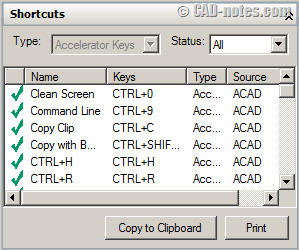 There are common Windows shortcut we can use in AutoCAD. Like [ctrl] + A to select all, [ctrl] + C to copyclip, and [ctrl] + V to pasteclip. Some AutoCAD users also use other applications intensively. They probably prefer this kind of shortcuts than command alias. But if you use AutoCAD as primary software, it’s more likely that you prefer command alias. If you open your CUI again, click shortcut keys under keyboard shortcuts. You will see a list of complete shortcuts on the right pane. If you select a command here, you will see the command’s properties below that pane. Find Key(s) below Access category here. Click … button. 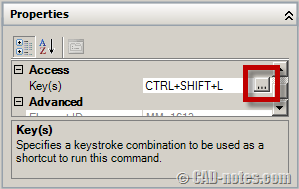 After AutoCAD open a small dialog box, press key combination that you want to assign. Ok, what if I want to add commands that’s not on the list? You can drag that command to shortcut keys category. 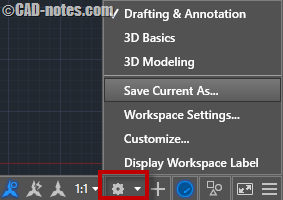 It is a good thing to add it to your own customization file, so you will not mess default AutoCAD CUI. And it would be easy to use it on other computer. You can simply load your customization file! Double click action is similar to right click menu. It’s context sensitive. You can define what command should be executed when you double click an object. 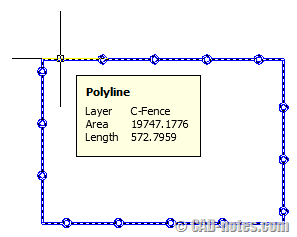 Lynn Allen has a tip on her blog before: convert a line to polyline with double click. OK, let’s just use Lynn’s tip to add this command to our CUI. Lynn uses AutoCAD default CUI, so I guess I need to explain extra steps if you want to add it to your own CUI. Create it on your own customization file. Right click double click actions, and choose new double click action in context menu. Select the action and change object name to LINE. Now drag your command below this action. You’ve done this several times, right? Close your CUI and give it a try! Previously, when we work with our own customization file, it will override default settings. For example, if you assign keyboard shortcut [ctrl] + A in your CUI, AutoCAD will use it instead of select all as defined as default command. I found that it’s different in mouse click. If you want to modify mouse click, you must change it directly in acad.cuix. If you know how to add this to our own cui without modifying acad cui, share in comment section below. Here’s a little explanation about mouse buttons. Common mouse we use is a 3 buttons mouse. The left button is button 1, right button is button 2, and middle button is button 3. See the structure below. You can also combined mouse click with [ctrl] and [shift] key. ctrl + shift + click > button 2 means: you hold [ctrl] and [shift] key then right click your mouse. Like working with other actions, you can change the assignment by dragging command here. Try to replace ctrl + shift + click button to with erase and see if it works! Why there are so many buttons? If you have more than 3 buttons mouse, you can assign commands to all of those buttons! Another thing you can do with CUI is to load AutoLISP file. There are several ways to load AutoLISP automatically. The other ways are you can use startup suite or acaddoc.lsp. However, if you intend to deploy customization to use for all users in your company, using CUI probably is the preferred way. You only need to load it once. 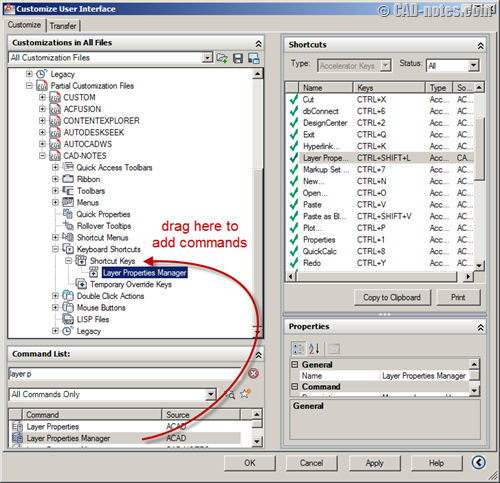 To load AutoLISP using CUI, right click above LISP files and choose load LISP from context menu. Consider to create a default location so all users can have the same folder in their computer. Otherwise, it will not work. Do you use these custom setup in your CUI? So do you use them already? If you are familiar with customization, you probably already do this. What is your favorite from these 5? If you haven’t which one do you think will be useful for you, and what will you use it for? Share it here! when i change quick properties (at Hatch) by hatch edit(^C^C_HATCHEDIT) it not changed .can you help me ? I have a Logitech M500 and cannot program the 2 thumb buttons. Any thoughts? Have you installed the mouse driver? Is the button already recognized in Windows? You can only use it in AutoCAD after Windows recognize it. Loaded and works with windows. Can’t find what to set the buttons to in setpoint for the button assignments to work in ACAD14. I have a Logitech m510 mouse that I cannot assign to other buttons. The keyboard entry works but I can’t seem to map them to any mouse key. Any help. I am running Auto Cad 2012.